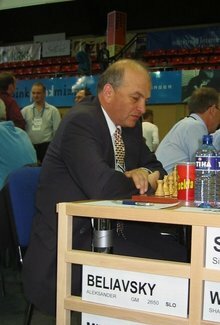 Alexander Beliavsky (born December 17 1953) is a noted Ukrainian chess grandmaster. He currently lives in Slovenia and he plays for the Olympic team there. He is noted for his uncompromising style of play and for his classical opening repertoire, including openings such as the Queen�s Gambit, Ruy Lopez and French Defence, for example. He won the World Junior Chess Championship in 1973 and the USSR Chess Championship in 1974 and 1990. In the April 2005 FIDE list, Beliavsky had an Elo rating of 2630, making him world number seventy-six and Slovenia\�s number one. This article is based on the article Alexander Beliavsky from the free encyclopaedia Wikipedia and stands under the GNU-Licence for free documentation. In the Wikipedia a list of the authors is available.